What are the Goals of Maintenance Therapy for Lung Cancer? You may have heard of friends and loved ones who have been on maintenance therapy for cancer. Yet maintenance therapy for lung cancer has only been looked at fairly recently. When is maintenance therapy used for lung cancer and what are the goals of this treatment? Before starting to talk about the medications used, it helps to define exactly what maintenance therapy is. Maintenance therapy is a type of treatment that is used with advanced lung cancer - specifically, advanced non-small cell lung cancer to attempt to improve survival, but not to “cure” cancer. This is in contrast to some treatments for the earlier stages of lung cancer that might be given with a cure in mind. A simple definition of maintenance therapy is the continued active treatment of a tumor that hasn’t progressed (worsened) after initial chemotherapy –- until there are signs that the cancer has progressed (worsened.) In other words, it is a treatment given with the goal of keeping a tumor that is not actively growing fast in check, not a treatment designed to shrink or cure a tumor. Maintenance therapy is used for disease management. It is not curative, yet it "does more" than palliative treatment in that it is designed to do more than help symptoms alone - its goal is to extend survival and quality of life during survival. To define maintenance therapy for lung cancer further, it is the use of medications after someone has been treated with four cycles of "first-line" chemotherapy for advanced (stage IIIA and stage IV) lung cancer if the cancer did not progress during this first-line treatment. Whereas in the past, people were not treated further at this point (and instead this was followed by a period of “watchful waiting” –- that is, monitoring symptoms and radiology studies to see if the cancer would grow), maintenance therapy is designed to help with the symptoms of cancer, and, hopefully improve survival time beyond that provided by the first-line chemotherapy. There are many controversies surrounding the use of maintenance therapy. As with any treatment, the side effects of treatment need to be weighed against any benefit. And -– in our current economy -– cost is also a consideration. Medications designed for “maintenance” can be very expensive. Some studies show only a very small improvement in survival (a matter of days to weeks at most), and families are often left with weighing a very modest improvement in survival with the financial burden of treatment. Alimta (pemetrexed) – In 2009, the FDA approved the use of Alimta for maintenance therapy for lung cancer. Tarceva (erlotinib) – The FDA approved Tarceva for use as maintenance therapy for lung cancer in 2010. As with most treatments for lung cancer, there are certain people who respond much better than others to therapy. Studies with Alimta have shown that it seems to be more effective for people with lung adenocarcinoma and large cell lung cancer. It also seems to be more effective in people who have an EGFR mutation. Studies with Tarceva also show improved survival primarily for people with non-small cell lung cancers that are not squamous cell lung cancer. It also seems to benefit people with an EGFR mutation to a greater degree than those who do not have the mutation. The greatest survival benefit for maintenance therapy with Tarceva was found for never-smoking women who were in good overall health otherwise at the time of their treatment. While maintenance therapy is used primarily for non-small cell lung cancer, recent clinical trials suggest there may be a role in extensive stage small cell lung cancer down the line, with a trend toward improved survival seen among people treated with maintenance sunitinib plus prophylactic cranial irradiation. It's been said that one of the "side effects" of maintenance therapy is that people don't get a sense of having finished treatment. In other words, they don't feel like "survivors." 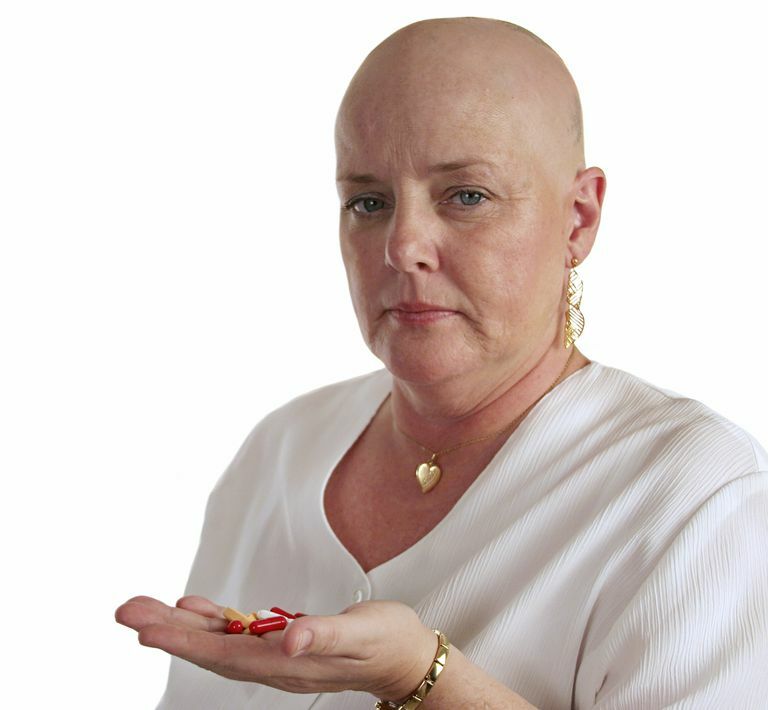 It may help to keep in mind that hormonal treatment for breast cancer treatment is considered maintenance therapy as well, and the vast majority of people who have had breast cancer continue to take hormonal therapy, either tamoxifen or an aromatase inhibitor when they have completed cancer treatment. It may also help to remind all of us of the definition of cancer survivor: someone is a cancer survivor from the moment they are diagnosed with the disease, and for the rest of their life. It's likely that with lung cancer maintenance therapy will increase in both the number of people using this treatment and in its significance. The concept is that we are beginning to treat lung cancer more and more like a chronic disease. We can't necessarily cure most people, but the disease can hopefully be controlled for extended periods of time. Ahn, M. et al. The Effectiveness of Maintenance Pharmacotherapies for Non-Small Cell Lung Cancer. Clinical Medical Insights. Oncology. 2012. 6:253-262. Banz, K. et al. Comparison of treatment costs of grade 3/4 adverse events associated with erlotinib or pemetrexed maintenance therapy for patients with advanced non-small-cell lung cancer (NSCLC) in Germany, France, Italy, and Spain. Lung Cancer. 2011 May 16. (Epub ahead of print). Brugger, W. et al. Prospective Molecular Marker Analyses of EGFR and KRAS From a Randomized, Placebo-Controlled Study of Erlotinib Maintenance Therapy in Advanced Non-Small-Cell Lung Cancer. Journal of Clinical Oncology. 2011 Oct 3. (Epub ahead of print). Cappuzzo, F. et al. Erlotinib as maintenance treatment in advanced non-small-cell lung cancer: a multicentre, randomized, placebo-controlled phase 3 study. Lancet Oncology. 2010. 11(6):521-9. Chen, X., Liu, Y., Roe, O. et al. Gefitinib or erlotinib as maintenance therapy in patients with advanced stage non-small cell lung cancer: a systematic review. PLoS One. 2013. 8(3):e5934. Ciuleanu, T. et al. Maintenance pemetrexed plus best supportive care versus placebo plus best supportive care for non-small-cell lung cancer: a randomized, double-blind, phase 3 study. Lancet. 2009. 374(9699):1432-40. Cohen, M. et al. Approval summary: erlotinib maintenance therapy of advanced/metastatic non-small cell lung cancer (NSCLC). The Oncologist. 2010. 15(12):1344-51. Cohen, M. et al. Approval summary: pemetrexed maintenance therapy of advanced/metastatic nonsquamous, non-small cell lung cancer (NSCLC). The Oncologist. 2010. 15(12):1352-8. Coudert, B. et al. Survival benefit with erlotinib maintenance therapy in patients with advanced non-small-cell lung cancer (NSCLC) according to response to first-line chemotherapy. Annals of Oncology. 2011 May 24. (Epub ahead of print). Dickson, R. et al. Erlotinib Monotherapy for the Maintenance Treatment of Non-Small Cell Lung Cancer after Previous Platinum-Containing Chemotherapy: A NICE Single Technology Appraisal. Pharmacoeconomics. 2011 Oct 3. (Epub ahead of print). Greenhalgh, J. et al. Pemetrexed for the maintenance treatment of locally advanced or metastatic non-small cell lung cancer. Health Technology Assessment. 2010. 14(Suppl. 2):33-9. Jiang, Y., Liu, L., Shen, L. et al. Traditional Chinese Medicine treatment as maintenance therapy in advanced non-small-cell lung cancer: A randomized controlled trial. Complementary Therapies in Medicine. 2016. 24:55-6. Han, Y., Wang, H., Xu, W. et al. Chinese herbal medicine as maintenance therapy for improving the quality of life for advanced non-small celllung cancer patients. Complementary Therapies in Medicine. 2016. 24:81-9. Hu, X., Pu, K., Feng, X. et al. Role of Gemcitabine and Pemetrexed as Maintenance Therapy in Advanced NSCLC: A Systematic Review and Meta-Analysis of Randomized Controlled Trials. PLoS One. 2016. 8:11(3):e0149247. Karayama, M., Inui, N., Fujisawa, T. et al. Maintenance therapy with pemetrexed and bevacizumab versus pemetrexed monotherapy after induction therapywith carboplatin, pemetrexed, and bevacizumab in patients with advanced non-squamous non small cell lung cancer. European Journal of Cancer. 2016 Feb 25. (Epub ahead of print). Klein, R. et al. Cost-effectiveness of pemetrexed as first-line maintenance therapy for advanced nonsquamous non-small cell lung cancer. Journal of Thoracic Oncology. 2010. 5(8):1263-72. Kulkarni, S., Vella, E., Coakley, N. et al. The Use of Systemic Treatment in the Maintenance of Patients with Non-small Cell Lung Cancer: A Systematic Review. Journal of Thoracic Oncology. 2016 Mar 21. (Epub ahead of print). Lu, S., Yu, Y., Chen, Z. et al. Maintenance Therapy Improves Survival Outcomes in Patients with Advanced Non-small Cell Lung Cancer: A Meta-analysis of 14 Studies. Lung. 193(5):805-14. Muir, V., and S. Chillon. Erlotinib: as maintenance monotherapy in non-small-cell lung cancer. BioDrugs. 2011. 25(3):139-46. Petrelli, F. et al. Erlotinib as maintenance therapy in patients with advanced non-small cell lung cancer: a pooled analysis of three randomized trials. Anticancer Drugs. 2011. 22(10):1010-9. Pinquie, F., de Chabot, G., Urban, T., and J. Hureaux. Maintanance Treatment by Eroltinib an Toxic Cardiomyopathy: A Case Report. Oncology. 2016. 90(3):176-7. Qi, W. et al. Erlotinib and pemetrexed as maintenance therapy for advanced non-small cell lung cancer: a systematic review and indirect comparison. Current Medical Research and Opinion. 2012 Mar 14. (Epub ahead of print). Rodriguez, P., Popa, X., Martinez, O. et al. . Clinical Cancer Research. 2016 Feb 29. (Epub ahead of print). Salama, J., Gu, L., Wang, X. et al. Positive Interaction between Prophylactic Cranial Irradiation and Maintenance Sunitinib for Untreated Extensive-Stage Small Cell Lung Cancer Patients After Standard Chemotherapy: A Secondary Analysis of CALGB 30504 (ALLIANCE). Journal of Thoracic Oncology. 2016. 11(3):361=9. Schneider, B. Maintenance sunitinib for extensive-stage small cell lung cancer: a new standard, an option or a step in the right direction?. Translational Lung Cancer Research. 2015. 4(5):6358. Shepherd, F. Maintenance Therapy Comes of Age for Non-Small-Cell Lung Cancer, but at What Cost?. Journal of Clinical Oncology. 2011 Oct 3. (Epub ahead of print).